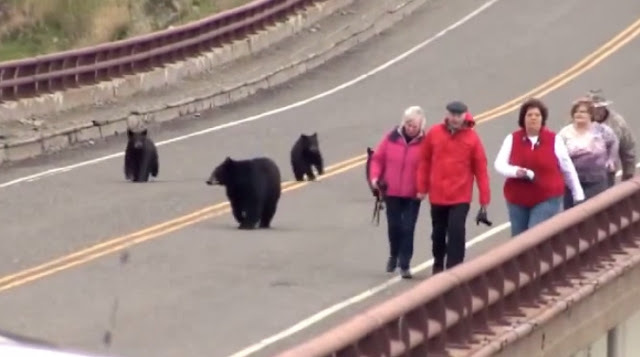 In a new video released by Montana Fish, Wildlife and Parks, tourists at Yellowstone National Park learned the hard way why you should never approach a black bear sow with her cubs. The video was shot Wednesday night on Highway 212, southeast of Gardiner. FWP Information Officer Vivaca Crowser was driving home with a colleague that night after a meeting in Yellowstone when she saw what's known in Montana as a "bear jam." 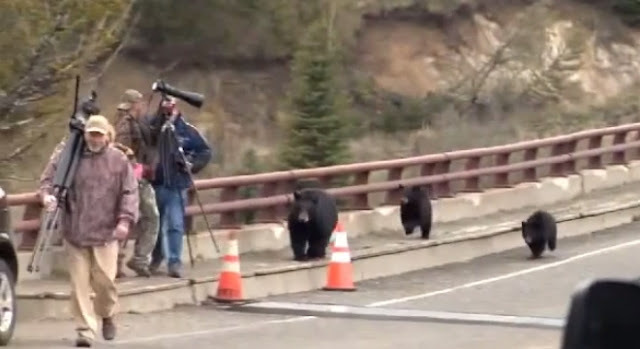 Dozens of tourists were pulled off on the side of the road for a close-up look of the sow and her three cubs. "People were just trying to inch closer to get a better view, to get a better picture," Crowser recalled. "And that's where they just really forgot about the caution and the respect for space that the bears needed in this case." So the bear reminded them, charging at the tourists with her cubs following, sending the tourists scattering. "Whether you're talking about a bear or another animal, with their young, they go into an instinctual protective mode where they're just doing what they can to keep their young safe," said Crowswer. "And so that's what you see here in the video, is the bear doing that." Luckily, no person, or bear was hurt. The sow and her cubs reconnected and climbed a tree for safety, and the tourists left with a lesson from the wild. Responses to "A friendly reminder to never approach a black bear with her cubs (Video)"